Light, lovely, and set to surprise and delight your recipient with it's bright blooms, this flower bouquet speaks to the magic that each day holds. 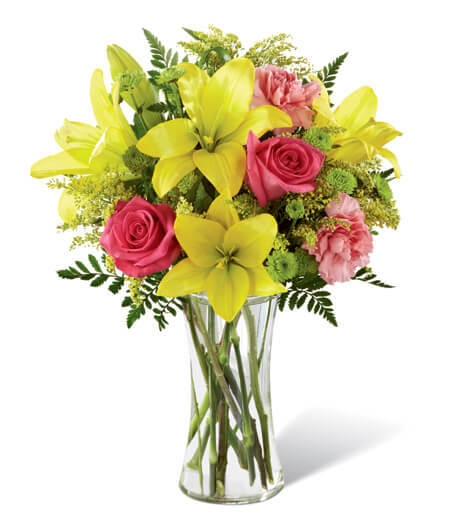 Brilliant yellow Asiatic Lilies are surrounded by hot pink roses, pink carnations, yellow solidago, and lush greens, beautifully arranged in a classic clear glass vase to create a gift that exudes warmth and happiness. A wonderful way to celebrate a birthday, or express your thank you, or congratulations wishes!